The Young Lakes are just one of many excellent day hike destinations near Tuolumne Meadows, reachable via two trails both about 6 miles in length, and while the western route is not so interesting, being mostly through thick woodland, the land opens out towards the end of the eastern trail, revealing stark granite mountains, pretty Alpine meadows and the lakes themselves, set beneath the north slopes of Ragged Peak. The official path ends by the shore of the lower lake, the largest, but the other two are easily seen by walking along a lesser trail, climbing a little way further east. The lakes are also popular as camping locations, the only drawback being the abundant mosquitoes in summer. Tall mountains rise up close by, including Sheep Peak, North Peak and Mt Conness, while the trail provides a great vista of countless more distant summits to the south, especially the jagged crest of the Cathedral Range. 13 views along the trail to Young Lakes. Panorama east of Ragged Peak. 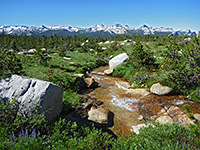 Both routes to the Young Lakes begin along the short side road to Soda Springs and Parsons Memorial Lodge - a busy place, like all locations near Tuolumne Meadows, especially on a summer weekend. The western path branches north after one mile of the Glen Aulin Trail, staying in woodland for 4 miles to a junction with the eastern path (described below), which starts near the Soda Springs road intersection and is also used to reach Dog Lake and Lembert Dome. This reaches the junction after 5.5 miles; from here the lower lake is one mile further. The east route is certainly more scenic because it crosses extensive meadows on the south side of Ragged Peak, around the upper end of Dingley Creek, giving wide ranging, long distance views. The eastern path (Dog Lake Trail) enters the woods and is flat at first, crossing a patch of granite slickrock then climbing a steep, bouldery slope before levelling out again, bridging a stream and arriving at a junction. Lembert Dome is right, and later Tuolumne Lodge (1.3 miles), while Dog Lake is 0.3 miles ahead, and the Young Lakes 5 miles. The lakes path soon forks off and is much narrower than before, traversing moist, partly grassy partly wooded terrain followed by a moderate ascent to a flat place, lacking any trees and so allowing the first glimpse of the granite slopes ahead. The trail descends a little to a stream (Delaney Creek), on the far side of which stretches a wide, short grass meadow. The creek is crossed using a fallen tree as a makeshift bridge, since the waters are just too wide to jump over. Next is another longish but gradual climb to a grassy plateau containing a few large dead trees, and then a brief descent to a smaller stream in quite dense woodland, which extends a little way further then opens to another flat area dotted with white boulders, while a steep granite rock face comes into view to the east. 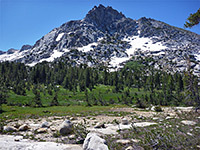 A meadow split by a tiny brook is followed by the last section of the forest, before the trees give way to an expansive, grassy hillside bordered to the north by Ragged Peak and a sharp granite ridge extending eastwards towards White Mountain. The trail crosses several small streams and a larger one (Dingley Creek), while climbing slightly towards a ridge on the west side of Ragged Peak. Views to the south are very good, across the stony grassland to the Cathedral Range, six miles away on the far side of Tuolumne Meadows. After a short, quite steep descent through more woodland, a junction is reached, with the alternative approach from Soda Springs (5 miles). The final section of the trail climbs again, fairly steeply, passing trees that become gradualy smaller, and ends by dropping down to the grassy flats at the west edge of lower Youngs Lake. Woods surround the water on three sides, but to the south rises a dramatic mountain ridge of fractured granite and scree slopes, culminating in Ragged Peak. 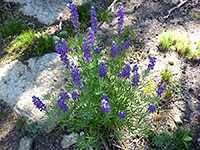 One such slope, close to the summit, provides a steep but relatively straightforward means to climb to the crest, and hence allows a shortcut back to the trailhead. The far (south) side is much less steep, sloping down to the meadowland around Dingley Creek; a hillside that has particularly abundant wildflowers in summer. 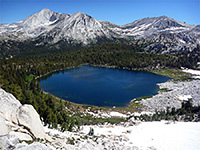 All three Young Lakes can be seen from the ridgetop, and also trailless Roosevelt Lake further north, below Mt Conness. The middle and upper Youngs Lake lie 0.5 and 0.8 miles further east, so both can be seen by another half hour walking, from the edge of the lower lake.